August 10 Deadline for Shoshone Wilderness Plan Comments–YOUR Help Needed! URGENT! YOU have the opportunity to comment on the use of domestic sheep, goats and pack goats in the Shoshone National Forest. The comment deadline of August 10th is fast approaching! The outcome of the final decision by the Shoshone National Forest regarding pack goat use will very likely have a domino effect on how other National Forests address pack goat use. The Shoshone National Forest has prepared a Supplemental Draft Environmental Impact Statement (SDEIS) for Use of Domestic Sheep, Goats, and Pack Goats, which is a Supplement to the Shoshone National Forest Plan, which was revised in May of 2015. The Shoshone National Forest proposes to limit areas where domestic sheep allotments are stocked and restrict the use of domestic goats and pack goats on the Forest to reduce the risk of disease transmission to bighorn sheep. Follow the links to the documents below. Neither is extremely long and you will find plenty to comment on regarding the possibility of disease transmission from pack goats to big horn sheep. The new best science available is not being used in these documents! After reading these two documents please submit your comments. Alternative #3 is NAPgA’s preferred alternative. It permits pack goat use in the Shoshone National Forest with the least amount of risk for the Bighorn Sheep. The 2016 GOAT MOVI STUDY CONDUCTED BY DR. MAGGIE HIGHLAND, a Veterinary Medical Officer and Researcher with the USDA-ARS-Animal Disease Research Unit, in collaboration with USDA-APHIS personnel is the most current best science available regarding the possibility of disease transmission from pack goats to Bighorn Sheep. From spring through fall of 2016, 576 goats (419 packgoats and 157 housed on premises with packgoats), from 83 premises located in 13 states, were sampled 3 times at 4 week minimum intervals to test for nasal presence/shedding of Movi. Nasal swab samples were collected in duplicate at each time point, with one nasal swab from each sample collection being tested in Dr. Highland’s laboratory and the second swab from the first sample collection being tested in an independent laboratory. Repeat nasal swab sampling of the goats in this study has confirmed the presence of Movi on just 5 of the 83 premises (6% of premises). 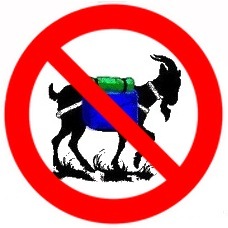 Premises that had Movi detected in any of the goats had between 7 to ≥15 goats present on the premises. Movi was confirmed to be present on the nasal swabs collected from 30 of the 576 goats tested; this means 94.8% of the goats tested had NO Movi detected on nasal swab samples. Of the 30 total confirmed Movi positive goats, 27 (or 90%) of them were ≤1 year of age (23 of them were <5 months). In summary, not only does the behavior and handling of pack goats drastically decrease the risk of a domestic pack goat coming into contact with a bighorn sheep, it would seem highly improbable based on this large scale study that a domestic pack goat would even be shedding Movi should such an unlikely contact occur. If you’re not sure what to say or how to say it, we have a form letter that you may use as a guide. We encourage you to rephrase it into your own words and add any further concerns of your own. Please remember to be courteous and professional in your wording. Previous PostNAPgA Rendezvous 2017 A Success!Next PostAugust Newsletter – Shoshone Comment Period Ends Soon!